Amazon Price: $29.99 (as of October 18, 2017 6:37 am - Details). Product prices and availability are accurate as of the date/time indicated and are subject to change. Any price and availability information displayed on the Amazon site at the time of purchase will apply to the purchase of this product. 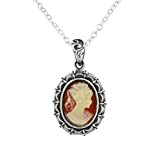 Romantic vintage-style cameo set in a sterling silver picture frame pendant. The cameo is resin. The pendant is 3/4" tall (1" with bail) and 9/16" wide. Sterling silver chain 16" long with a 2" extender. Photo enlarged to show details.